The Summit wasn’t even built on my first visit to Big Sky. I believe a building for the two gondolas (that have since been replaced) was on that site and perhaps some rental and retail shops. By my third trip, which would have been around the year 2000 or so, the Summit had been built but our group did not stay here. We looked on, jealous, as some folks were able to ski right up to the back patio of the property. We tried not to be envious as we could see the massive hot pool as we skied between the property and the Ram Charger lift. But we failed miserably. 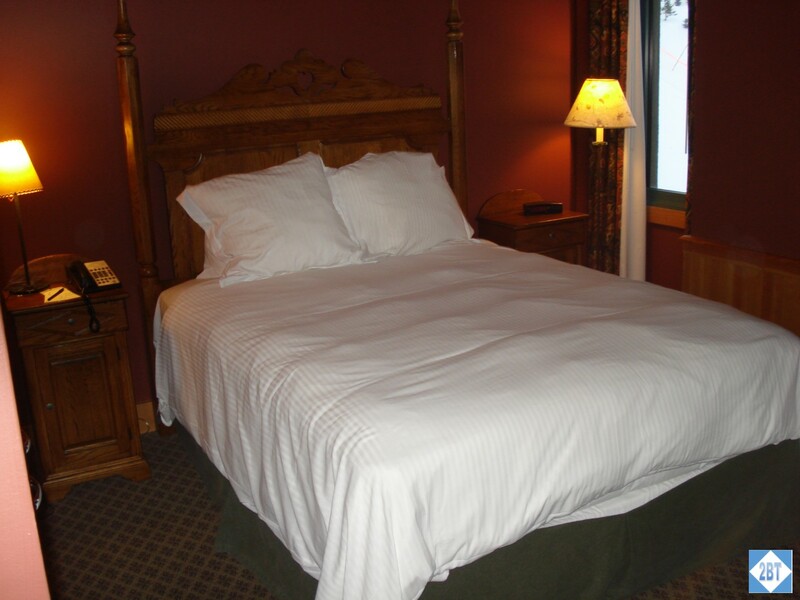 The next time our club visited, we stayed at The Summit and it’s where we’ve stayed every trip since. The room setup is what I’d call “configurable condos”. Every condo I’ve been in has had at least one bedroom that could be locked-off and rented separately has a hotel room. 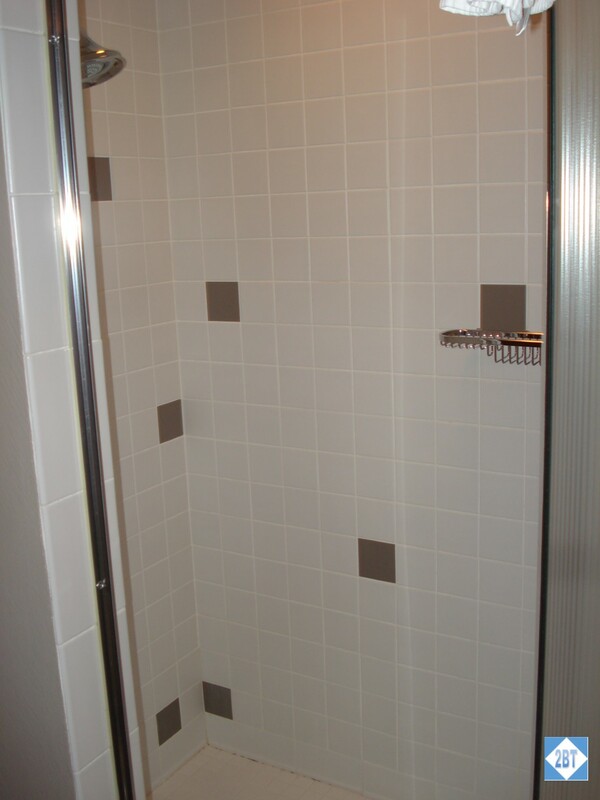 But at the end of the hallways are the other type of two and three bedroom units. 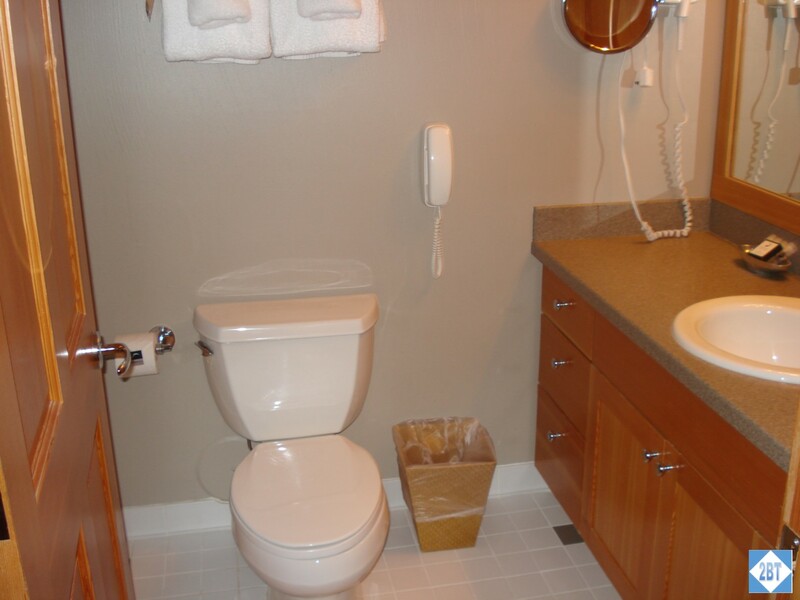 Photos in this post are from a 2BR unit at the end of the hallway. They are very similar, with the difference being the extra bedroom. 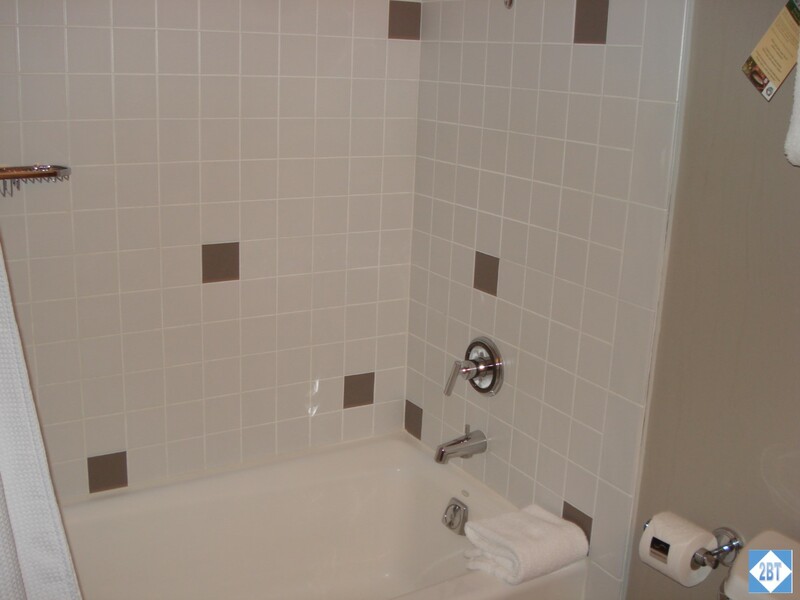 In the three bedroom unit the middle bedroom will often have a Jacuzzi tub there in the bedroom. 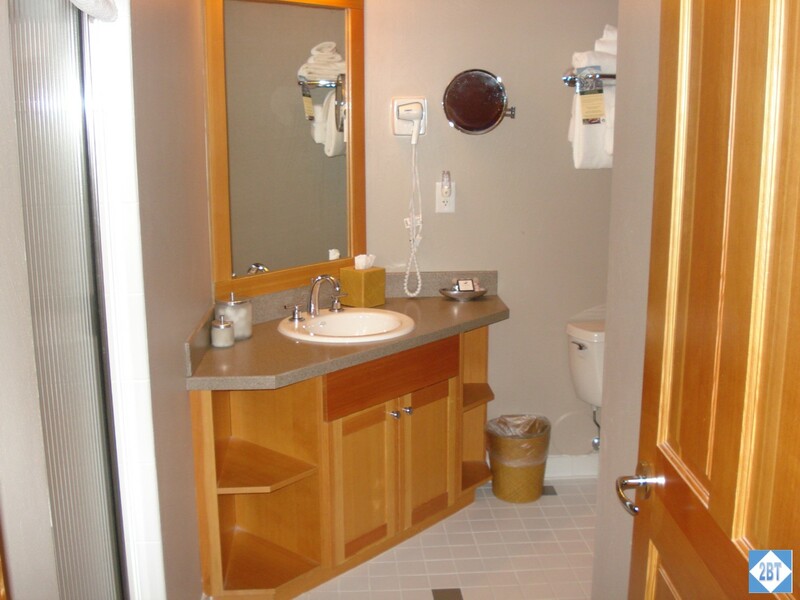 Both of these type of units have sleeper sofas and a full bath in the interior hallway. 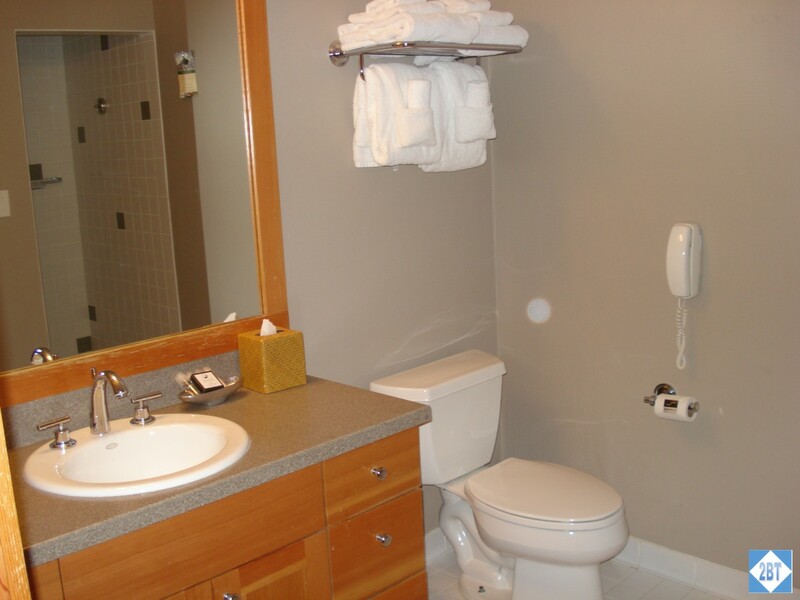 So technically up to two people could sleep on the pull-out sofa and use that bathroom – or, as we tend to use it, one of the people in the lock-off bedroom with 2 Queen beds could use it while the other person uses the bath in the room. The master bedroom in these units has a what looks to be a double bed. Several different couples have complained about the tight quarters in that room. 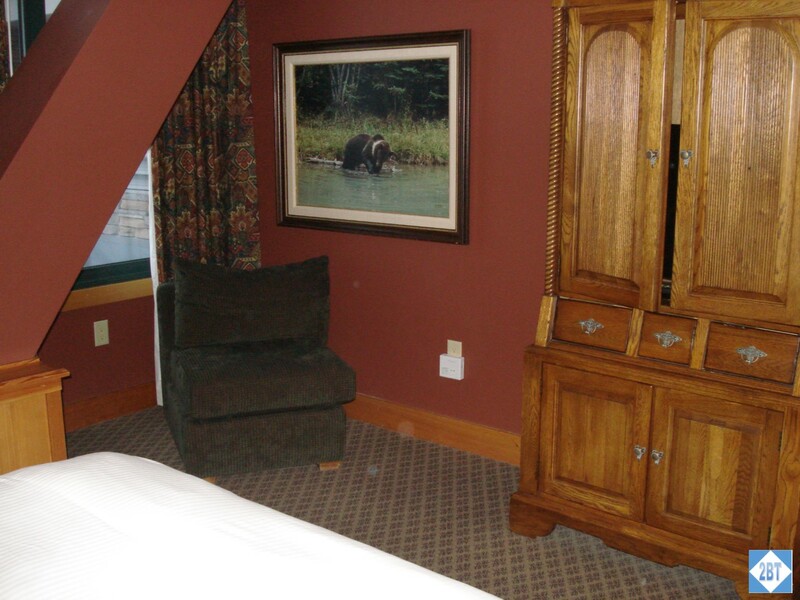 The second bedroom with the Jacuzzi features a king bed. 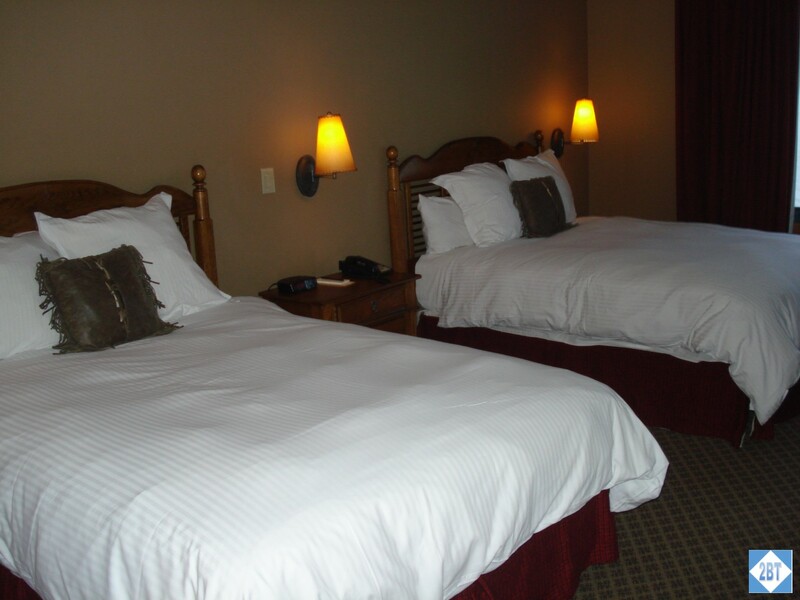 The second bedroom in our unit had two queen beds. In the 3BR condos, there’s another BR with a king bed. 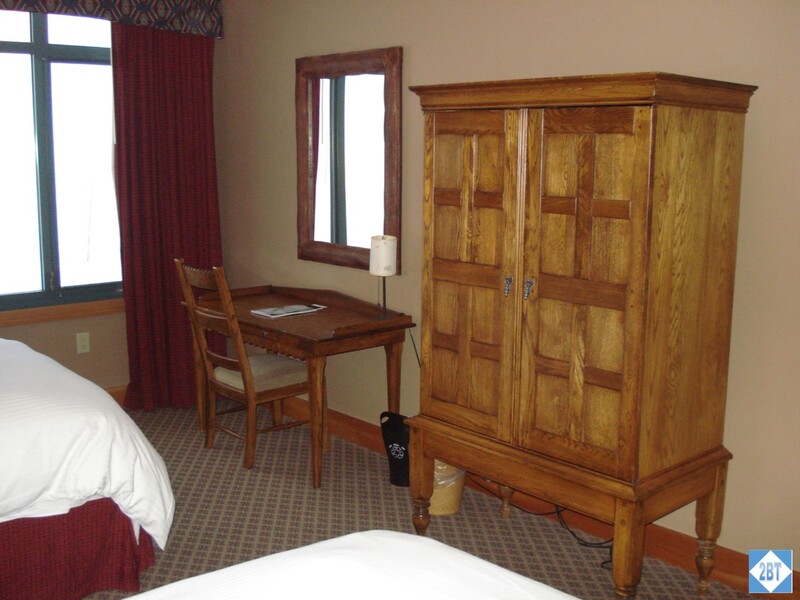 Furnishings of the 2Q bedroom. There are six small drawers in the cabinet, which doubles as an entertainment center. 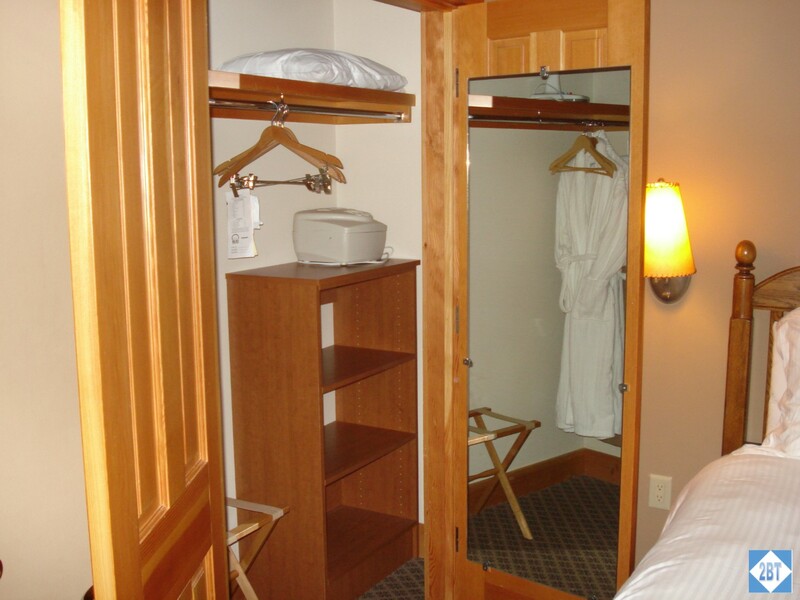 As this room can be locked off into a hotel-style room, the closet in the 2Q room is quite large. 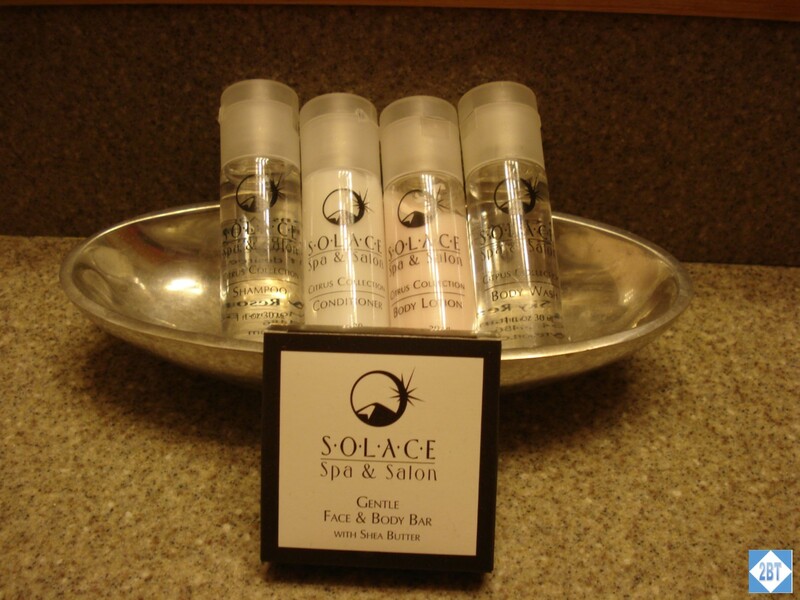 Toiletries are branded with the name of the resort-owned spa: Solace. The living/dining room of these end units is much larger and they have dining tables that will seat at least 6 people. 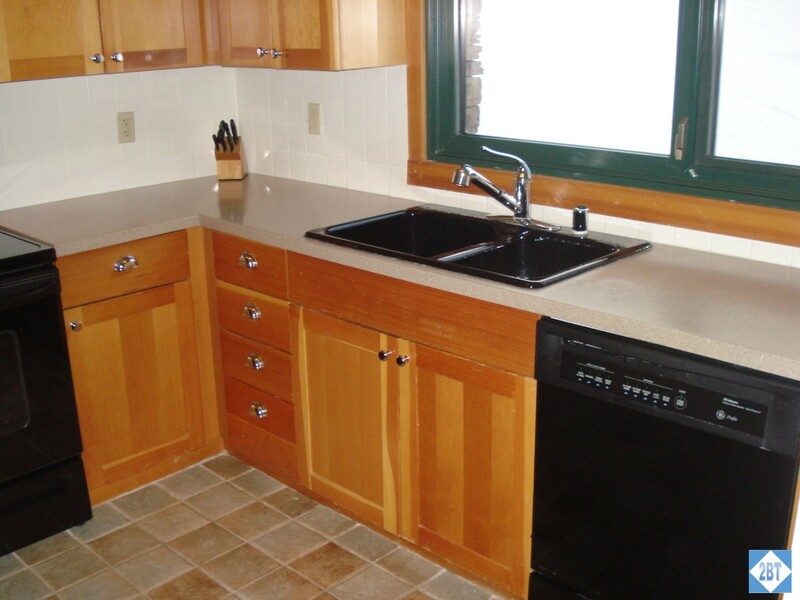 These rooms also have galley-style kitchens that have a good bit more counter and cabinet space than the units in the middle of the building. The living room is a little hard to capture in photos as it’s too dark with the curtains closed and too bright with them open! The sleeper sofa could be used if needed. The large dining table seats six comfortably. 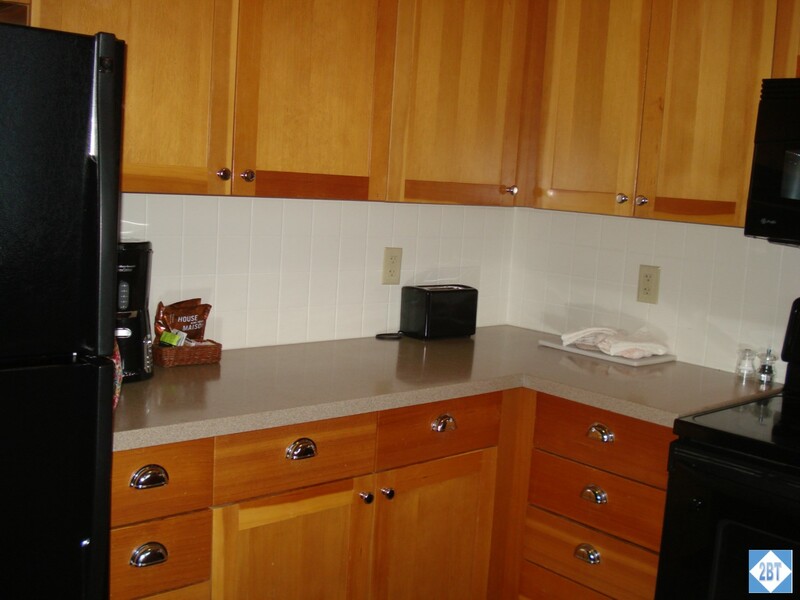 The galley kitchen is not large but is twice the size of the kitchen nook in some of the units located in the middle of the building. As I mentioned above, the Summit is right at the base of the slopes, just steps from the Ram Charger lift, which is at the left side of the base as you look at the mountain. 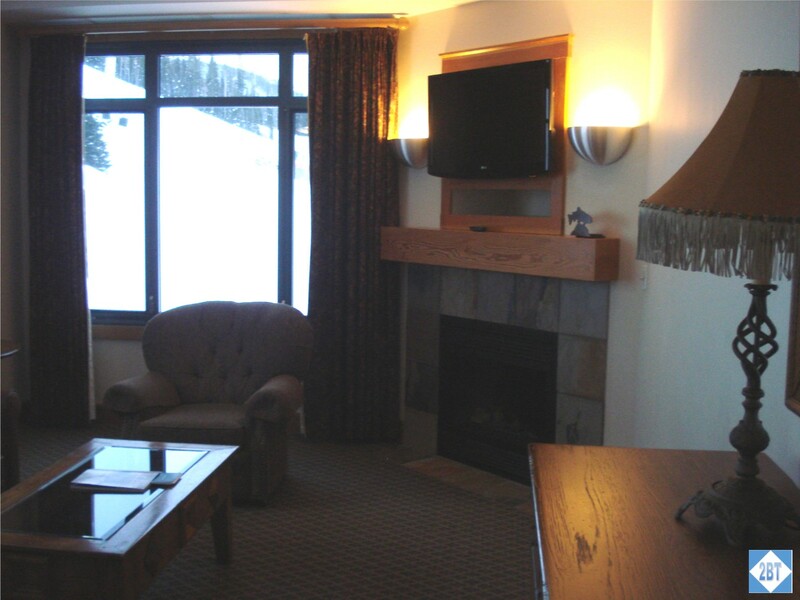 You can literally ski right up to the (heated) back patio of the Summit. 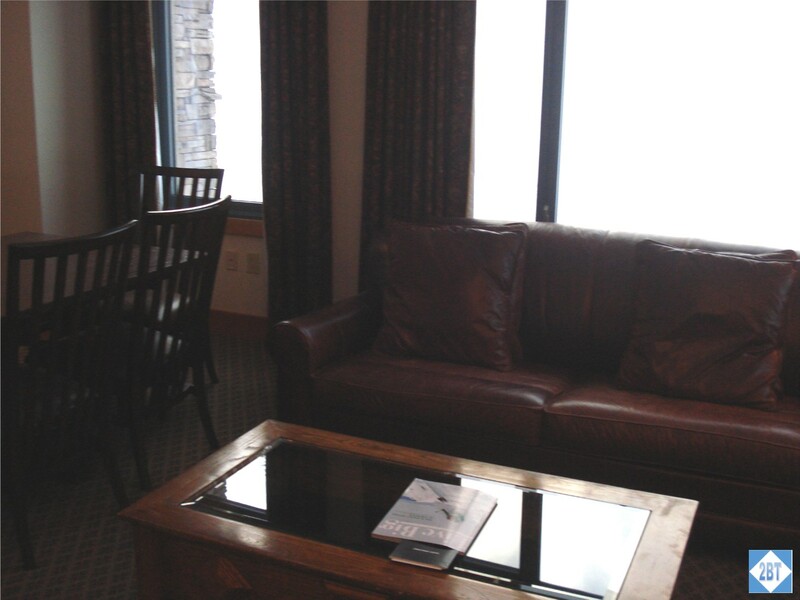 There you will find a ski check that is complimentary for all guests. They’ll even send your skis to get waxed and/or tuned over night if you like. The Swift Current lift is easily visible from the ski check are but it is uphill just a little bit. But several of the friendly ski check workers carried our skis up to the the base of that lift for us – and we didn’t even ask them to do so! 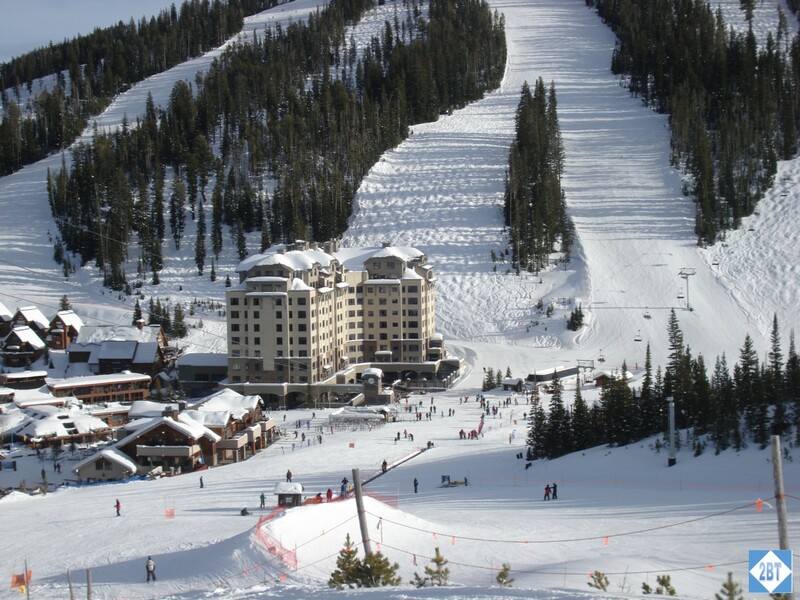 The base area of Big Sky is very compact so even though the Summit is at one end of the main plaza, it is a very short walk to anything else at the base. It not only has seating around the edges but has an island in the center with seats as well. There’s a patio with chairs between the pool and the building and this is where the staff will come with drinks. There’s a glass wall separating the pool area from the slopes which does a pretty good job of keeping those stiff winter breezes from chilling your nose. In short, it’s a fantastic way to end your ski day! I just wish I’d realized I did not have any photos of the hot tub. Will come back and add those some day. There are two restaurants and a coffee cart in the building. The Carabiner Lounge has a full-service bar and is great for a reasonably-priced lunch. The Peaks Restaurant serves breakfast, lunch and dinner but is a bit pricier though the food is quite good. On one end of the second floor is a retail shop and at the other end is a self-service laundry. I believe there’s a charge to wash but the dryers are free – or maybe it’s the other way around. But one of the two is free. The front desk and concierge are located on the ground floor. 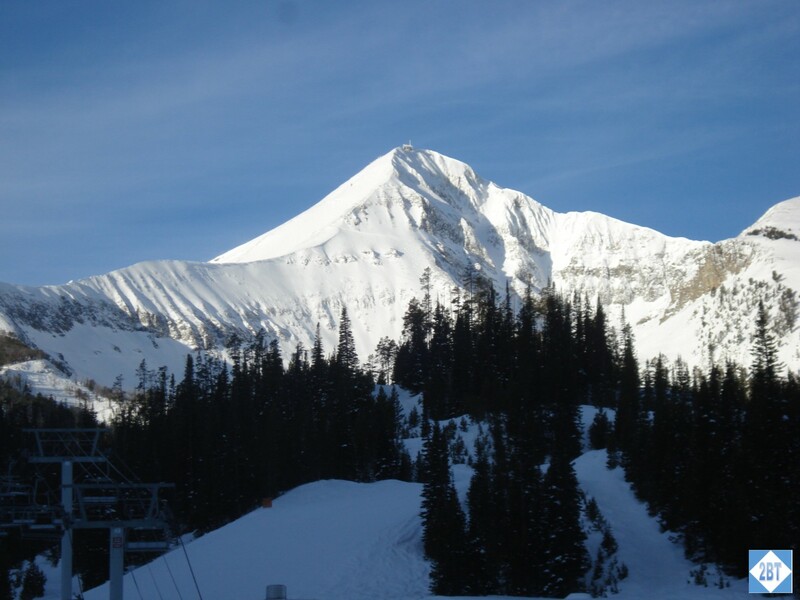 The concierge can assist with dining options at Buck’s T-4 (down the main highway from Big Sky) and with day trips to Yellowstone National Park or with snowmobiling or fly fishing. 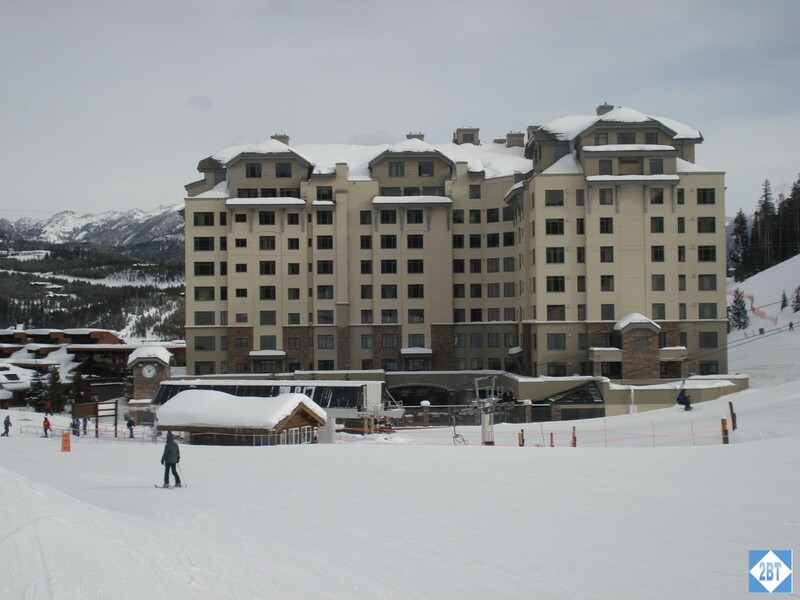 I understand the property is undergoing some renovation this year and prices will go up for next ski season. But I have no doubt it will be worth it. It truly is the best place to stay in Big Sky. View of Lone Peak from a 9th Floor condo. Other than the view from the penthouse on the 10th floor, I think this is the best view in the building.